Summer is filled with celebrations, from weddings and graduation parties to holiday get-togethers. Whether you’re a small, start-up catering business, a mom preparing to celebrate her recent grad or a large banquet hall gearing up for wedding season, Burkett Restaurant Equipment has all of the serving line equipment and supplies you need – from set up to tear down – at the right price. Concessions Appliances: Burkett Restaurant Equipment offers a wide range of concession equipment ideal for catering and buffet services. Burkett carries new equipment for every concession need, whether you’re serving hot beverages from your new cappuccino machine, fresh soft pretzels from a heated merchandiser, or hot and juicy hot dogs off the roller grill. Don’t forget to pick up condiment dispensers so your customers can doctor up their snacks, and a popcorn machine to entice patrons with the smell of fresh popcorn wafting through the air. Shop our entire collection of concession equipment and supplies today for quality and variety. Serving and Display Ware: One of the most important parts of a successful catering experience is the manner in which food and drink is served. For businesses, this means it is vital they have the proper equipment and supplies to present and serve food in an appealing and efficient manner. Burkett provides a selection of catering supplies including a wide variety of serving and display ware. Hot & Cold Buffet Stations: When the temperature of the food you serve is a priority, having the right equipment is vital. Cold Buffet Stations make it easy to keep your cold food chilled and ready to serve. Hot buffet stations are great for cafeterias, presentations, travelling restaurants, and catering companies because they are mobile. Utility Buffet Stations make it easy to keep your cold food chilled and ready to serve. You can choose from refrigerated cold food serving stations and non-refrigerated cold food serving stations to meet your business needs depending on what you are serving and where you are serving it at. Banquet Carts: From Sunday brunch to memorable events and tabletop displays, banquet carts are valuable pieces of catering equipment when it comes to promoting your culinary excellence. 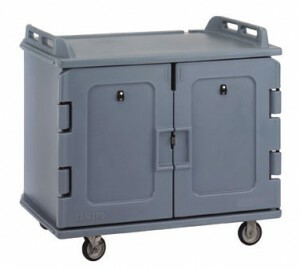 Banquet carts designed to be mobile, keeping hot goods fresh for foodservice operations. Banquet cabinets are especially great for catering services because of their mobility. We sell a variety of heated cabinets with capacities ranging from 14 to 36 pans to keep it at just the right size for your uses. Chafers & Accessories: Find all your chafing dishes, pans, and accessories at Burkett Restaurant Equipment & Supplies. Our high quality chafers, including stainless steel chafing pans, and accessories will keep your buffet elegant and efficient. We offer chafing dishes and more from the leading manufacturers and brands at the low prices you love.